The Minnesota Institute for Sustainable Agriculture Profiles in Sustainable Agriculture featured our farm in 2011. They felt that we demonstrated innovative ways to integrating our pastured poultry and hogs with our tree and small fruit production. Since this profile in 2011, we have added sheep to our grazing rotations and more than doubled our fruit production. 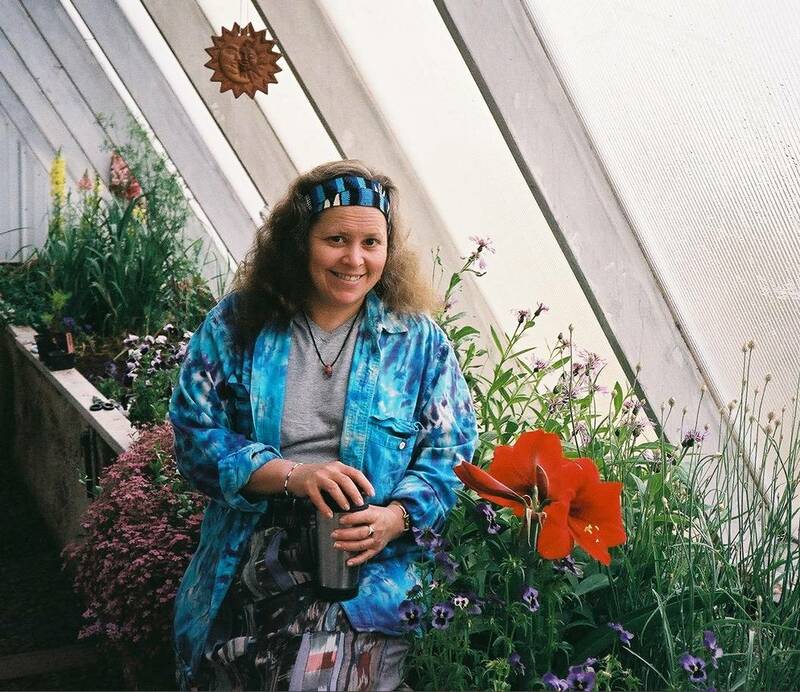 In 1998, long before we started farming, we built an experimental year-round, solar greenhouse. Greywater from our house irrigates the greenhouse beds and we produce herbs, flowers, vegetables and greens for our family. As an experimental system, every 3 years we report how this system is preforming St. Louis County Health Department. In his infinite wisdom, Jeff insisted that we plant flowers in the greenhouse too. So that in February, when we lust most for the hope of spring we are reminded that it is coming. 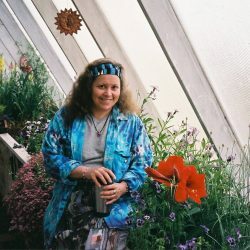 I think it’s very cool that the University of MN is now supporting innovations related to year-round greenhouses…here’s a link you might like to their Deep Winter Greenhouse resource page! 1) MN Department of Agriculture Sustainable Demonstration Grant program, see the MN Green Book for our projects and LOTS of other great MN Sustainable Farming projects. 2) Sustainable Agriculture Research and Education (S.A.R.E.) Farmer-Rancher Grant program (Download Report). determine the impacts of grazing by hogs alone and in combination with Cornish Cross or Red Broilers on the relative changes in plant composition and pasture productivity. determine the financial break-even point for each chicken breeds related to any changes in pasture forage quantity or quality (e.g. the lbs. of feed required per unit finished weight of chickens). This project was designed to genetically identify apple trees in Duluth using genetic markers, and to map historic apple trees in the area. Over 300 apple samples were gathered from the UMD Seedling Trial Orchard and public spaces or from contributions from interested community members. Of these, 184 were genotyped and 140 of them could be analyzed for varietal identity. Twelve of these were matched to known cultivars. An additional 21 samples matched at least one other sample in the dataset, suggesting that these may represent locally adapted trees that were historically shared among landowners. We have created a solid base for future work in the lab and with the community, and we plan to pursue additional funding to continue the project to more completely document the apple diversity in the Duluth region. If you are interested in learning a more about the genetics of this project, Download our Poster. Developing Profitable Apple Production Along Lake Superior’s North Shore with focus on High-Density Orchards and Heritage Apple. 2014-2016, funded by the MN Department of Agriculture Sustainable Demonstration Grant program. 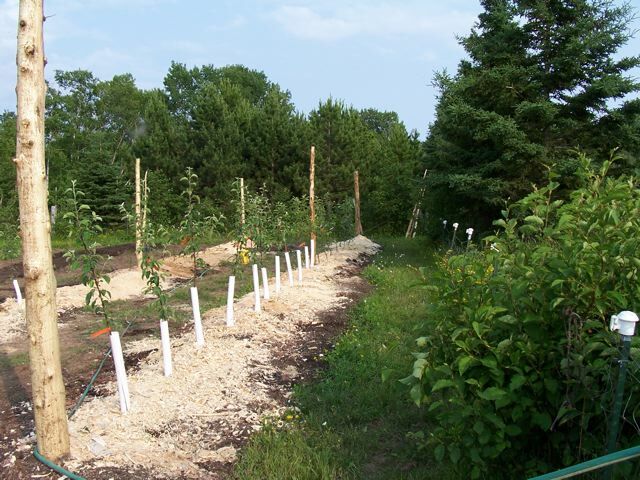 Over 3 years, 5 sites along the north shore of Minnesota will demonstrate high-density trellised apple production and trial different rootstock with modern and historic varieties. Cindy Hale, with Diane Booth-Cook Co. Extension Director, will form a “North Shore Apple Grower Network” to support production of apples using organic and Integrated Pest Management among small producers. We will emphasize strategies to maximize production and profit given the climate, soil and landscape constraints and lower pest pressure north shore growers experience. Production, climate and IPM data collected annually at each site will be shared through the grower’s network, workshops/field days, a website, and through collaborations with local & regional farming organizations. We will also collect leaves for genetic typing with Dr. Briana Gross ,UMD Department of Biology, from historic apple trees along the north shore that are known to produce high quality apples. We hope to determine which of these trees may be described varieties and which may be undescribed varieties that were locally grown and thus are especially well adapted to our region. These varieties will be propagated using modern rootstock and assessed as to their value for our local production efforts. Contact Cindy Hale info@clovervalleyfarms.com if you’d like to be involved in these efforts! Also check out the list of 2015 orchard workshops and events related to orchards. See the MN Green Book for our projects and LOTS of other great MN Sustainable Farming projects. Assessing the Technical and Market Feasibility for Development of an Artisanal Vinegary. The goal of this project was to conduct a study including the technical and market feasibility to assess the viability of developing an artisanal vinegary that would produce a line of high value culinary vinegars for regional distribution from locally & sustainably produced raw ingredients. 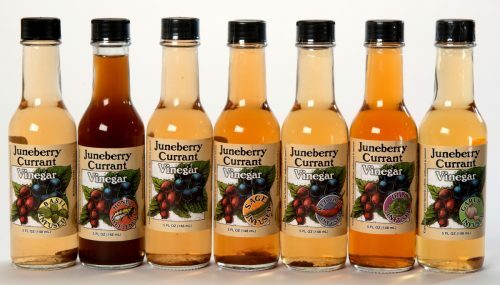 Marketability of this product will be enhanced relative to commercial grade vinegars by unique flavors, qualities and uses of the product itself and a marketing plan that emphasizes the local and sustainable production of the product. 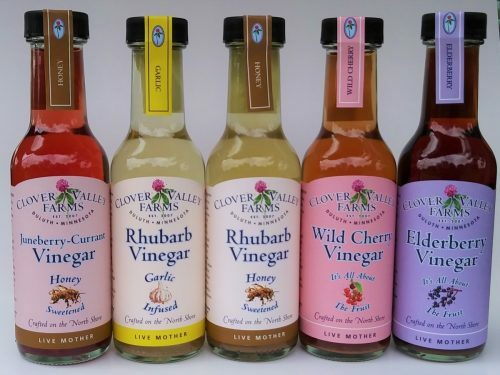 The vinegars will be made from wines that are custom fermented using Clover Valley Farm fruits (i.e. apples, plums, cherries, juneberries, rhubarb, currants, etc.). To enhance the culinary variety, we will also infuse our vinegars with herbs and spices also grown by Clover Valley Farms. At the completion of the market and feasibility study we received a cost sharing grant from the Minnesota Department of Agriculture purchase equipment for our vinegar processing facility! We are indebted to them all for their generosity in helping us along this path! Our first bottled vinegars were unveiled in April 2014. The base vinegar, Juneberry-Currant Honey Wine Vinegar, is fabulous in its own right. To add culinary flavor and variety we also infused small batches of the fruit vinegar with a fabulous variety of our own herbs and spices including Dill, Garlic, Basil, Sage, Rosemary, Mint, Red Chili and a Honey Sweetened version too! Developing and branding of an Artisanal Vinegary. Provided working capital to build our farm business through a comprehensive brand assessment and re-branding effort. Our original vinegar labels (left) and shrub labels (right)…while lovely, were confusing for customers and did not sell well off the shelves of our wholesale customers. 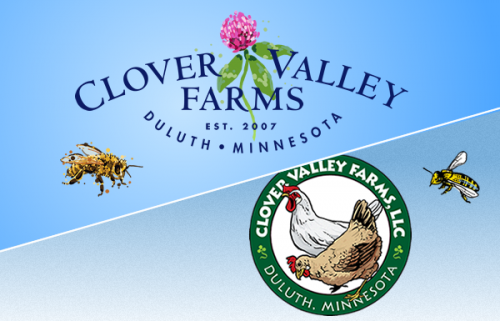 The logo with the chickens was no longer representative of our business, since we no longer do pastured poultry, and was also redesigned. 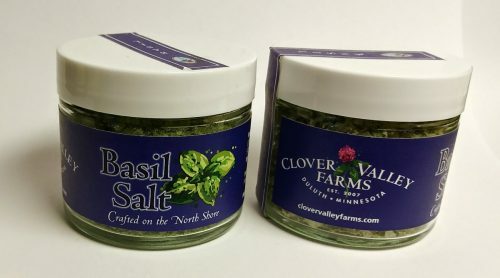 Check out our Online Marketplace to buy directly from us or find us at stores, restaurants and events around the region.